Project MyMATE will develop a platform and content management system capable of addressing the different needs of the individual elderly user, (e.g. medical, pharmaceutical, bio-monitoring and physical characterization, evaluation of emotional state, physical activity, leisure activities, etc.). As illustrated in the following diagram, unlike existing paradigms and approaches which use virtual visualisation techniques like avatars, the MyMATE environment will involve a community of elderly volunteers, coordinated from the elderly care centres/care providers, acting as “human sensors” responsible for providing the interface with the system in the elderly primary user’s home, thus providing the emotional and “human face” to the structure. An innovative gamification approach will lie at the heart of the MyMATE solution. Many elderly people, when they reach the age of retirement, are in perfect health, have a wealth of expertise and a desire to make a positive contribution to the society in which they live. After a careful selection process which will adhere to all regulatory requirements, professional care coordinators at each elderly care centre, (called tertiary users in the MyMATE environment), represented by 3 user partners in the consortium, will select and train elderly volunteers, (secondary users), who will implement, the “missions” specified by those professionals responsible for coordinating care interventions, e.g. conversation and accompaniment visits, bio-physical data collection, medication schedules, leisure activities and physical exercise routines, etc.). The selection of volunteers will be made taking into account a range of criteria such as personal profile, abilities, skills, time availability and mandatory regulatory/ethical requirements, the nature of which differ depending on the location of the users involved. For example, in the UK, working with elderly people would require secondary users to undergo a criminal records check. Missions will be organized by the ICT-solution using a “matching” system assisting in establishing “harmonies” between profiles of people. The system will also include processes for controlling “good and best practices” of volunteers. All this will be constantly monitored and managed by competent professionals at elderly care centres. The “informal caregivers” (volunteers) will be supported remotely by the “formal caregivers”. In this sense the “informal caregivers” will provide the necessary human contact which the elderly primary user needs to ensure a better quality of life. Equipped with mobile devices and specific applications required to carry out mission activities, volunteers will enter into the MyMATE system the relevant data necessary to complete each mission assigned. 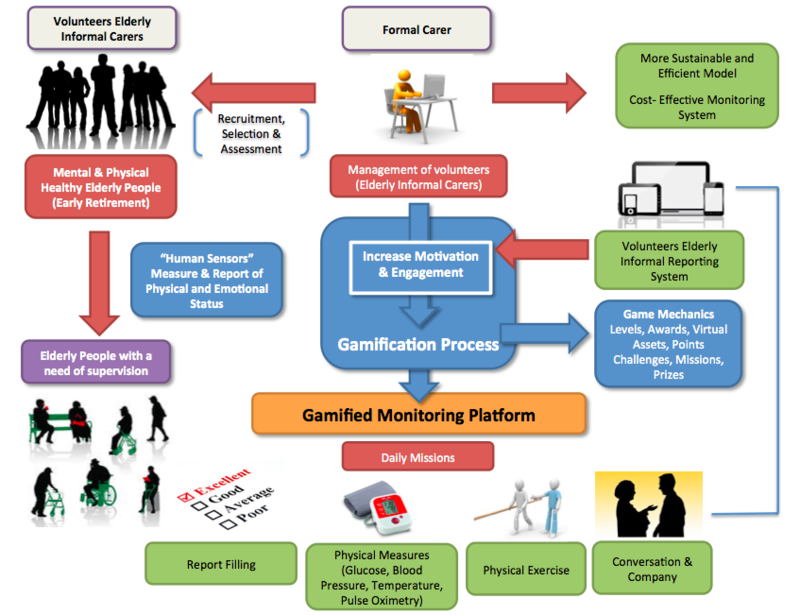 In order to establish the MyMATE Community, the “performance process in missions” will be subjected to Gamification procedures that, through a system of rewards included in the platform, will encourage and recognize the participation and contribution of elderly volunteers to improve the situation of physical and psychosocial health of primary users in their environment. This dimension of the project will be organised and managed by the MyMATE Joint Venture using the revenue streams from the sale and maintenance of the MyMATE platform and will involve an on-line prize catalogue which will detail the prizes on offer that can be exchanged through accumulating required levels of rewards/credits.